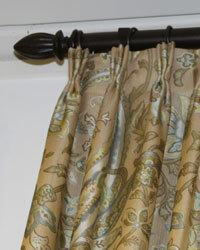 Shop name brand traditional curtain rods and drapery rods that range in price from affordable with budget priced sets from Graber and Kirsch to higher end designer lines like Robert Allen, Vesta, Finestra, Brimar and Paris Texas Hardware among many others. 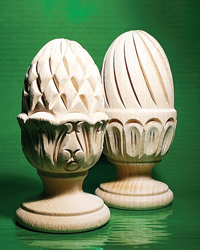 A full compliment of coordinating traditional hardware is offered, including; curtain rings, brackets and finials with elaborate hand carved designs designs in wood and less expensive resin reproductions. 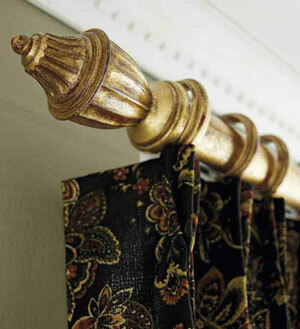 A wide variety of traditional designs and styles are offered in these curtain rods which are made of wood, wrought iron, steel and brass in decorative classic and timeless variations. 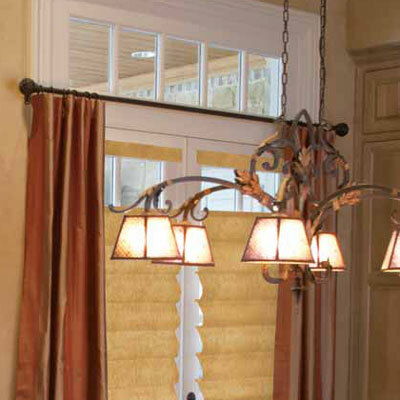 The wide range of colors and finishes that are offered to highlight these traditional curtain and drapery rods help complete that designer look that will showcase a sophisticated and formal or a casual decorating look in your home. 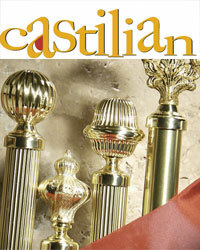 The Vesta Castilian solid brass curtain rods and hardware is designed to complement any traditional design theme. 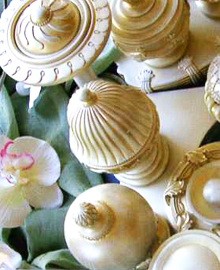 Your window treatments will experience the look and feel of solid brass décor with these brass curtain rods and brass finials, brass curtain rings and brackets. 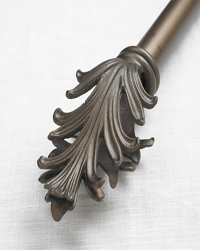 Inspired by Early American furniture styles, these wood curtain rods by Robert Allen features turned and hand carved finials. 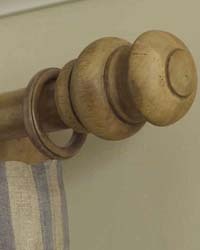 Natural wood variations add charm and craftmanship to the beauty of the wood finishes found in these Classic wood curtain rods that are 1.75" in diameter. 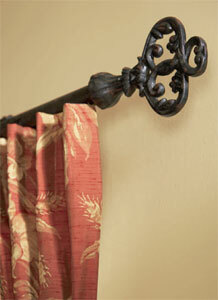 Finestra Curtain Rods are designed to ship quickly while providing a custom finish. Choose from the 25 designer colors that are offered in this large selection of affordably priced curtain rods which offers wood poles in 1 3/8", 2" and 3" diameters. Lengths of 4, 6, 8 and 12 feet are offered along with a splice for adjoining two poles for extra large windows. 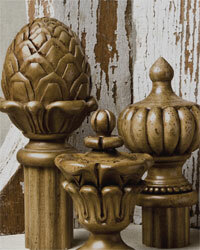 Created and finished in the USA the designs in the finials are hand carved from wood and then made into a mold which is used to form the wood resin finials. All of the Finestra curtain rods and hardware are hand finished; therefore, the finish will differ slightly from rod to rod and bracket to bracket. 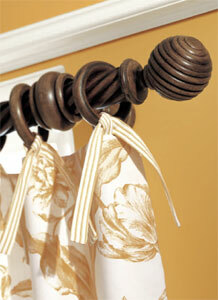 The rods and poles as well as standard and decorative curtain rings and brackets are made out of wood. 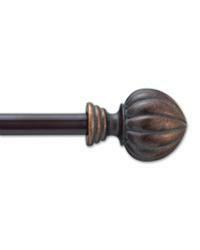 The Finestra curtain rods wood curtain rod collection is primarily traditional, but some of the simpler finials work great with modern decor. For a tropical look an affordable line of bamboo curtain rods in 1 3/8", 2" and a large 3" diameter with complementing bamboo curtain rings that are available individually or bulk packed. The Finestra curtain rods also offers a variety of bracket styles which include inside brackets, adjustable swivel brackets to accommodate bay windows and windows of every angle, as well as solid elbow brackets for going around inside and outside corners. 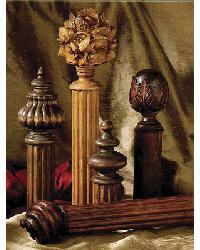 The Vesta Highland Timber unfinished wood curtain rods and hardware features a gallery of masterfully carved finials and coordinating accessories. These unfinished wood curtain rods offer four pole diameters and ranges from understated and simple to intrinsically elegant designs. 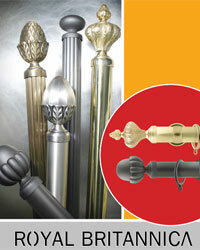 The Kailey wood curtain rods and hardware feature finials that have intricate decorative details and smooth surfaces. 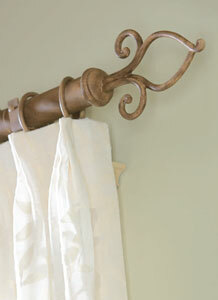 The gorgeous wood curtain rod hardware speaks so highly of your decorative sense, that you'll love to show it off! 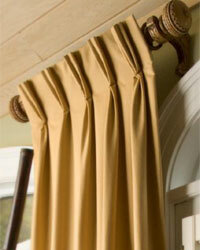 The 2 inch wood curtain rods are offered in lengths of 4, 6, 8, 12 and 16 foot lengths in a smooth, fluted and twist shape. 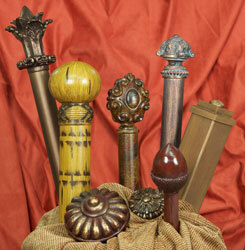 4 delicious custom colors to finish the look of these decorative wood curtain rods are offered. 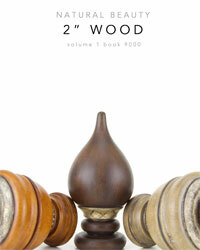 The Stout Natural Beauty features gorgeous 2" diameter wood curtain rods and wood traverse rods in five furniture grade finishes: Chocolate, Walnut, Acorn, Pickled Oak and Ash. 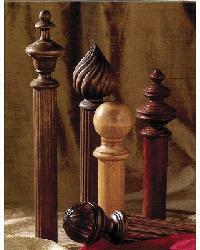 These wood curtain rods and wood traverse rods feature a wide selection of finial choices along with curtain rod end caps, brackets and curtain rings. 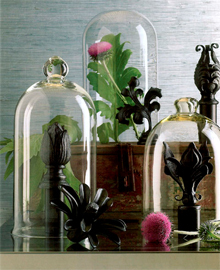 The Nostalgia by Brimar features wood curtain rods that have been paired with cast resin finials in an offering of seven gorgeous finishes. These 1 3/8" wood curtain rods offer hardware to complete the great looks of your window treatments with wood curtain rings with eyelets, brackets, rosettes and batons. 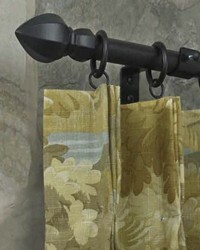 Inspired by the city of lights these decorative wood curtain rods in the Parisian by Robert Allen combines wrought iron fences, floral garlands and polished marble accents. 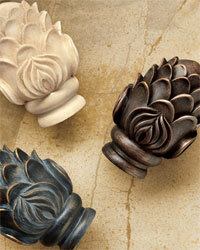 The classic styles with whimsical designs in the finials will make a sophisticated statement to any window treatment. 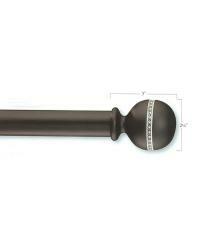 The smooth and fluted 1 1/2" and 2 1/4" diameter wood curtain rods are offered in 4, 6 and 8 foot lengths, with a splice being available for larger windows. 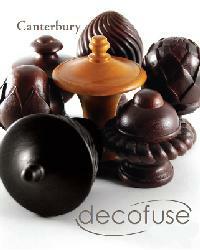 Finishes offer gorgeous shades of mahogany, oak, walnut and vintage gold in the wood poles and large resin finial offering. 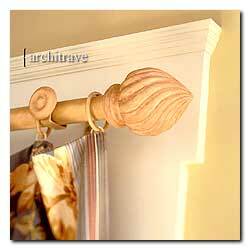 Brackets feature fancy scroll designs in their single and double curtain rod brackets. 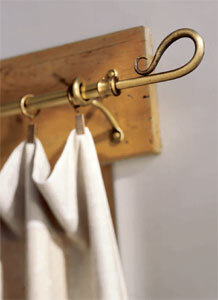 Curtain rings offer a plain to decorative look with eyelets. 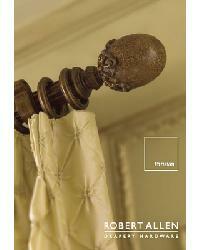 The Parisian wood curtain rodsby Robert Allen offers other hardware that includes tiebacks, end caps and swivel brackets for bay windows and other angled windows. 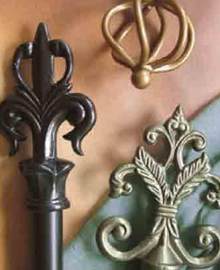 The Provence iron curtain rods and hardware accessories by Robert Allen offers a Euro country look that is created by shaping metal into graceful curves and elegant scrolls. 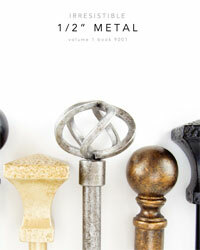 The 6 finial styles that are offered, feature a heavy wire look in some unique and interesting designs. The 1" and 1 1/2" metal curtain rods are available in 4 and 8 foot lengths with connectors being available for larger windows. 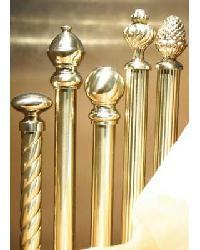 The rods, finials and all the other drapery hardware is offered in 4 color choices; antique white, earth rust, golden brass and black iron. 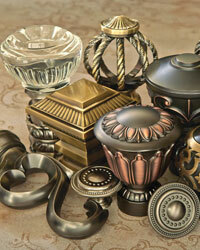 Finishes are hand applied by carefully combining layers of color for a feeling of antiquity and color depth. Slight color variances are possible. 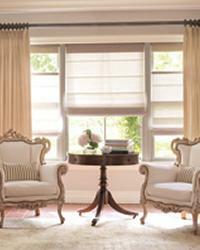 The coordinating tiebacks offer flexibility for a number of window treatment designs. 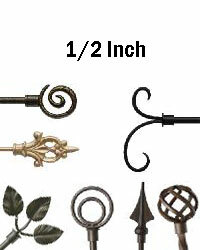 The hardware also includes wrought iron curtain rings with eyelets to accommodate either sized curtain rod. The inside mount, single and double brackets offer several projection depths to accommodate a variety of drapery returns. Also available are end caps for use when mounting inside and for finishing the end of your secondary rod when doing a double window treatment. 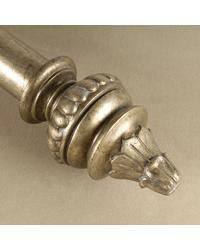 The finials, iron curtain rods, brackets and rings are all composed of metal. 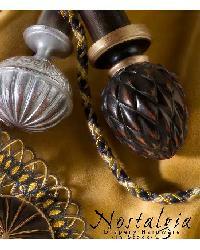 The Vesta Royal Britannica metal curtain rods will make a statement in metal with these metal curtain rods that are 1 9/16" in diameter. 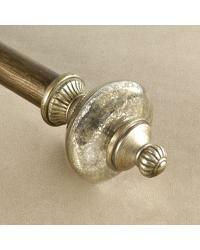 Choose from finishes in antique brass, antique nickel, old black and polished brass finials, brackets and curtain rods that are in stock and ready to ship. 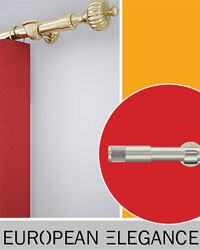 A tube splice is also available to create extra long metal curtain rods. 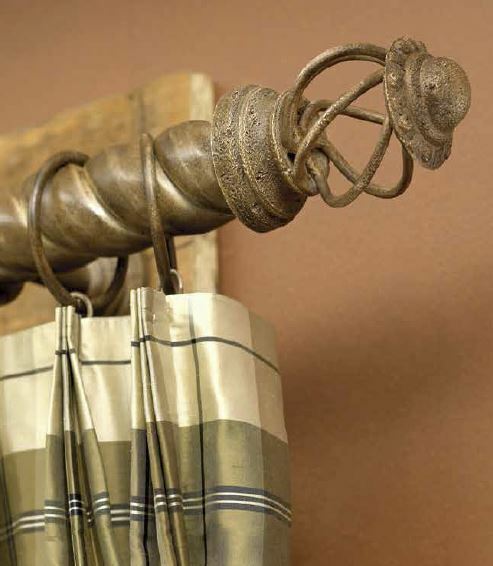 Available in 2 sizes and 6 great finishes, including unfinished; the Signature wood curtain rods by Brimar brings a traditional look to your homes decor. With intricate carvings and 3 pole designs of smooth, reeded and twist or rope style these 2" and 3" wood curtain rods are a great choice for your window treatments. 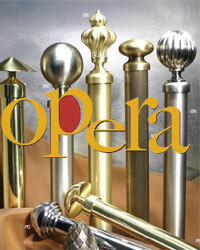 Coordinating drapery hardware is offered with includes brackets and curtain rings. 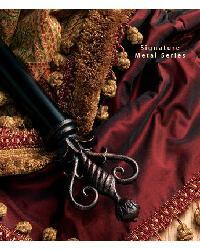 The Versailles by Brimar embodies metallic brilliance by virture of water gilding. 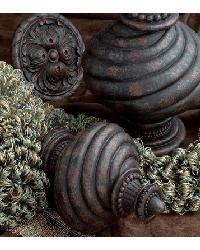 This unique ancient art entails aritsans hand applying layers of gesso and red clay followed by a meticulous process utilizing water to aid in the application of the gold or silver leaf. 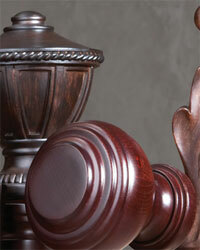 Select details are then polished revealing the clay for an elegant aged affect. 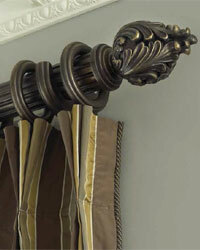 Beautiful hand painted pieces in a rich dark walnut grain also complement the Versailles wood curtain rods by Brimar. 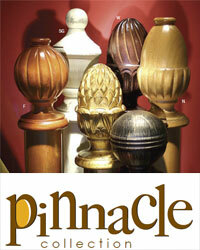 The 12 finials fit the ends of the 2 inch smooth or reeded curtain rods that are available in 4 and 8 foot lengths. 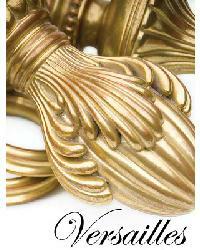 A full compliment of drapery hardware to complete the great looks of the Versailles are also offered.